Toronto Maple Leafs fire coach Ron Wilson! 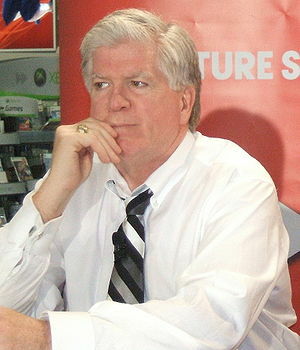 The Spotlight is now on GM Brian Burke. So the Toronto Maple Leafs have decided to fire head coach Ron Wilson late on Friday the 2nd of March. I saw the news break first on CP24, then I took to Twitter and slowly the reports started to come in. I thought Friday night was an odd time to fire the coach and announce the replacement, former Leaf Randy Carlyle – who was the head coach in Anaheim when Brian Burke was the General Manager and the Ducks won the Stanley Cup. It was odd because, while expected, the Leafs are in Montreal tonight to play the Canadiens, and if there was ever a pressure situation it is tonight, and with Burke flying to Montreal to tell Wilson personally there was no one here to address the media. Here are some of my thoughts surrounding Brian Burke and his bravado. 1) When Burke can to Toronto he inherited Wilson – who was hired by then GM Cliff Fletcher (of the Jeff Finger signing, ugh). Wilson, like Burke are both Americans. 2) Burke immediately brought in Phil Kessel, an American forward playing with the Boston Bruins who after testicular cancer was made available because he’s moody and not viewed by everyone as being a team player. The Leafs gave up two first round picks for Kessel at a time when the Leafs were terrible and though Burke thought the picks were going to be mid-round, they turned out to be very high picks including 2nd overall. Burke sadly overestimated the talent on the team and I belive the ability of the coach. 3) Burke announced he needed “Truculence” on the team and proceeded to stock the roster with so-called tough guys who are not so tough, or are tough but cannot play a regular shift with the team. Colton Orr, Jay Rosehill, tough but limited in their abilities. Mike Komisarek in from Montreal as a high-priced free agent, Francois Beauchemin and Mike Brown in from the Ducks… It was time to raid the Ducks for their toughness and goaltending because that is what former GM’s do, right. They take from their former team even when that team is performing worse that the new team. 4) With that not working, Burke started signing all the free agents from US colleges in hope of being able to stock the team and have assets to trade of fill holes since they were not doing it through the draft – recall, the B’s are getting quality picks from the terrible Leafs, like the #2 overall pick Tyler Seguin who in his 1st season with the Bruins won the Stanley Cup and in year 2 is second in scoring on the Bruins as of today with 50 points and a plus 33. Sure Kessel has 68 points and Joffrey Lupul, another reclamation project from Anaheim has 66 points and Kessel is only 4 years older than Seguin, but comparing the two, it might come down to character which the Leafs appear to lack. So the Leafs brought in Tyler Bozak, Christian Hansen, the Monster, Colby Armstrong, Komisarek, and with that came and went the hopes of Leafs’ fans. Kadri might be a bust, Kuliman went from 30 goals to 5 goals and Jake Gardiner was a throw in for the Leafs taking Lupul’s salary, not a shrewd move by Burke and don’t let him convince you otherwise. With no talent, Burke has resorted to trading for injured players – Connelly, Lombardi, etc, signing college players and bringing in overpriced free agents which would be a great stop-gap if there were young players, but the scouting staff has let the Buds down for the last, oh, 35 years. 5) Burke brings in Tim Connolly from the Sabres – often injured, and slow skaters but great passer who has clearly lost a step, but still leaves the team without a true number one centre – the defense is strong and deep, but no secondary scoring and no number one centre hurts this team and was an issue in 2008 when Burke arrived. 6) Burke announces his intention to trade up in the entry draft to get a blue-chip prospect – like he did when drafting the Sedin’s in Vancouver, but doesn’t. Instead he drafts more American players for Canada’s team. 8) Burke brings in renowned goalie coach Francois Allaire who does nothing to help Jonas “the Monster” Gustavsson, or James Reimer – or J.S. Giguere who was a salary dump from the Ducks that the Leafs gladly assumed – Instead of turning them into the next Martin Brodeur, they both drop to their knees once a shot is taken and are at risk for collisions with their heads as has been witnessed by both players being hit in the head by other players. 9) In an odd exchange, Burke did nothing at the trade deadline this past week and after doing so pronounced that the players were a little hesitant because of all the trade talk in Toronto and they should play better now that the deadline is over. Burke even went so far as to announce that next year he is going to impose his own trade deadline a week prior so that he can mess up what has become Trade Deadline Day festivities in Canada. Actually, he wants to impose this so the players don’t have to worry at deadline time about being traded. So when Burkie mentioned upon his arrival in Toronto that he wanted to bring in players who could handle the pressure here I guess this was a #fail. Then in startling fashion the next night after the Leafs lost it was the coach throwing the GM under the bus by stating that the team is not good enough and the GM didn’t bring in any new players. Ouch. 10) Burke gave Wilson a one year contract extension on the hush hush, then announced it via Twitter a few days after it started to leak. Nice golden handshake, eh? Wilson is 15 losses away from holding the record for the most losses by any coach in NHL history. He has a gazillion wins too, lets not forget that, but he won’t set that record in Toronto. The team has played on hot streaks which show good coaching but has been on crappy streaks which shows the coach in unable to motivate the players to play better. It’s 50/50. Is the team not up to par or is it the wrong coach. The NHL’s youngest team is falling further and further out of contention and something had to be done. Burke did not want to do this, folks, I guarantee this. Now that the coach is gone, all fingers point squarely at Burke. If the team falters from here on in, and I give the suits at Maple Leafs Sports and Entertainment one full season to assess the Burke / Carlyle duo and it there is no progress, I guarantee you, Burke is out of here. Off to save another franchise or more realistically he’s going to face the same fate of any player / goalie / coach or GM that leaves Toronto, meaning that he’s done in the league. Tweet Tweet. Ride’s over. Last stop, Toronto. Mr. Carlyle. Your stop. Good luck.